If you love your bike and you love your love, and you both love bicycles? This is the print for you! Once again this year S'n'S will be organizing a month long art show in Philadelphia with hand printed art work from over 15 Gig Poster artists. Mugshots CoffeeHouse on Fairmont has graciously hosted S'n'S for all five seasons. 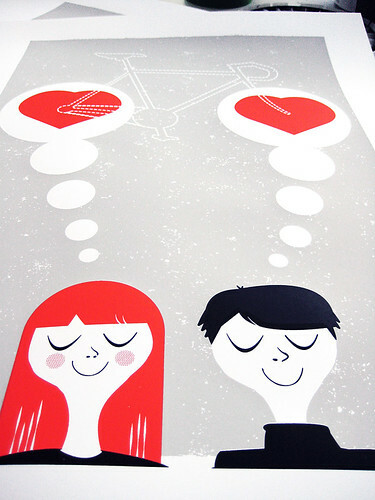 Thinking of You is our 3-color, all hand silkscreen printed art print, carefully printed one layer at a time, with soft cloud grey, bright love red, and black hand-mixed and non-toxic water based silkscreen inks. Edition of 200. Size: 16 x22 inches (39.4 cm x 55.9 cm.) Paper: no acid, archival Cougar, White 100lb cover weight.